Orthodontics is the branch of dentistry that deals with the prevention, detection and treatment of deformities of the jaws and teeth (malocclusion). Functional Orthopedics refers to the favorable influence of skeletal structures by the active influence of functional processes. For example, a patient with a lower jaw that doesn't come forward enough, can be treated with a functional orthodontic device, for example an activator. The activator trains the patient to push their lower jaw forward. If this stimulus is maintained long enough, it should cause a skeletal manifestation, e.g. a growth of the lower jaw that goes beyond its genetically determined degree. Classic functional orthodontic devices are removable. By the application of larger forces to the upper or lower jaw, usually more than 500 cN, a growth inducing effect can be generated. For example, the lower jaw's growth can be inhibited by using a head-chin-cap and the maxillary protraction by use of a Delaire or Gummons mask. Orthodontics is, in contrast to functional orthodontic influencing of skeletal structures, the moving of teeth. Orthodontic tooth movement can be made with removable or fixed appliances, although fixed appliances are generally preferable because of the movements that can be made and the duration of the treatment, as well as the independence with the cooperation of the patient. 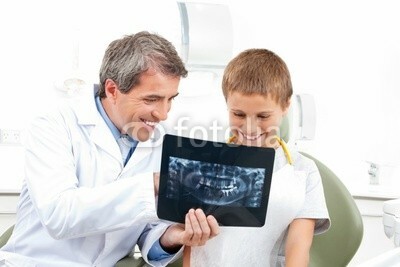 Orthodontic measures can also be taken long after the completion of growth, e.g. for adults. If there is a jaw misalignment (malocclusion) after the completion of growth, that can't be compensated by orthodontic measures, it is possible to improve the situation through surgery. In this case, the orthodontist must work with a maxillofacial surgeon.